"Hi I'm Rachel from These Girls Can Run. 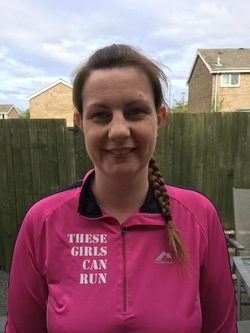 I work mainly with These Girls Can Run Cramlington but you will sometimes find me at some of the other groups providing cover and support where I can. I was never a runner, even at school I would try to get out of it at every opportunity. but I enjoy it and that makes all the difference. If you'd have asked me a year ago if I'd be a group leader I would have laughed at you but if I can learn to run anyone can! What's even better is I've made some great friends along the way!"